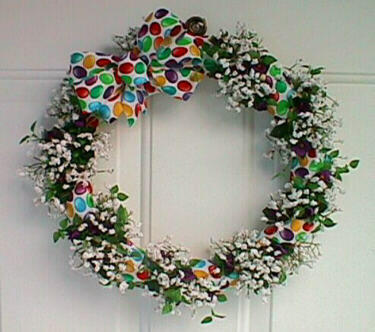 When putting a ribbon and bow on a wreath, it's easier to attach them BEFORE you attach the florals. Loosely wrap ribbon around wreath, leaving approximately 3" space between wraps. Glue or pick ribbon ends at back side. Insert flower picks around wreath in spaces between ribbons. Insert Baby's Breath picks to fill in bare spots. Determine hanger location on back side of wreath. Insert florist wire and twist to form a loop. Hang in desired location and fluff bow loops. NOTE: It is much easier to cut the picks apart, and insert and glue smaller pieces. I always cut picks apart, and sort sizes prior to placement. There are many other objects that can be used to fill in a wreath. I love to use brightly colored eggs (plastic) over a base of white baby's breath. Simply glue or pick eggs in place! How many variations can YOU think of? !